Sydney Shop Girl: Synchronicity. News That Should've Been Front Page. Other Things. Synchronicity. News That Should've Been Front Page. Other Things. 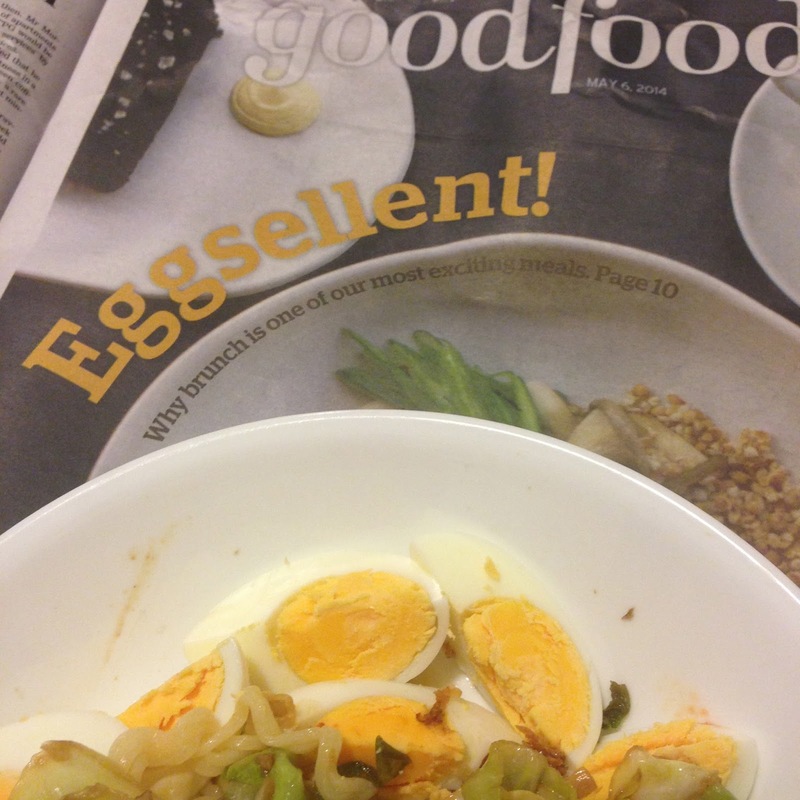 Eggsellent cover of today's Good Food, may I introduce my equally eggsellent dinner of hard boiled eggs, instant noodles and a stir fry. It's not the most attractive stir fry ever photographed but tonight marked a turning point in my stir frying journey. I actually mastered cooking my vegies without having them go soggy and soupy on me. The secret, I think, isn't just a hot wok but also a sparsely populated one. I tend to overload my wok whenever I try to stir fry and I think this drops the cooking temperature too much. 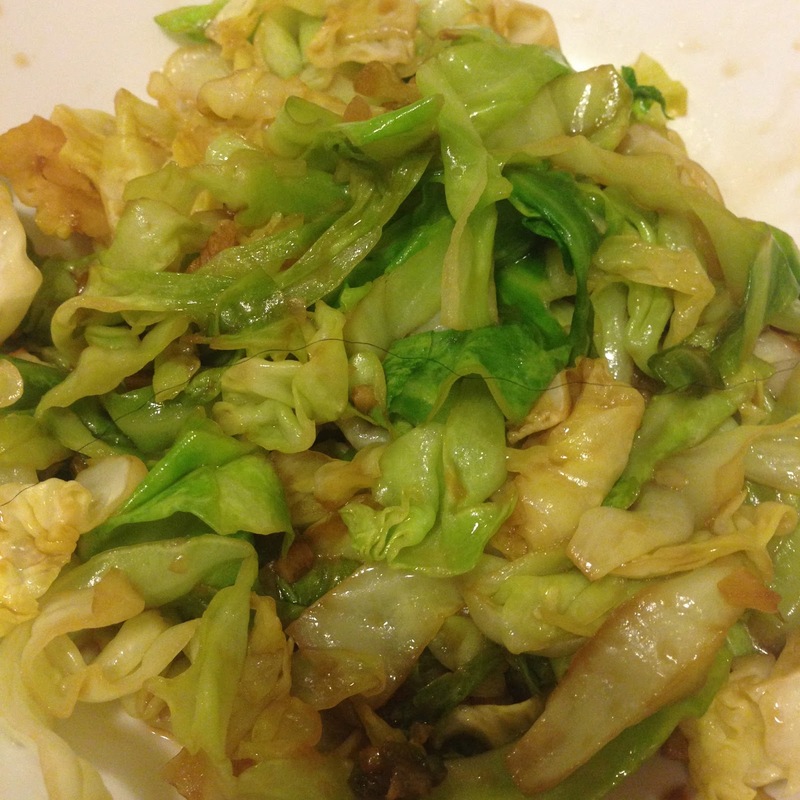 If you're a cabbage fan, this is the super easy cabbage stir fry recipe that I used. I won't lie. I read all three pages of the SMH's breathless coverage of The Brawl in Bondi (I'm only linking for any lucky international readers who may have somehow missed the media storm). Then I drove to work in silence because every radio station in Sydney appeared to be fixated on the punch, the dentures and James' black eye. The thing is, it wasn't exactly a slow news day. 276 Nigerian school girls have been kidnapped with their government seemingly incapable of mounting an effective search for them. As each day passes, the terrifying possibilities as to what has become of them seems to multiply. The single minded Mr Putin has managed to get a law passed in Russia under which blogs with traffic of more than 3000 visits a day must register themselves with the government or face tough penalties. The law has been thought of as a method of controlling political dissent on the internet. As a woman with all the big issues on her mind, my first thought was what Mr Putin and the regulators would make of the Russian fashion bloggers who meet this criteria? The hair, the make up, the poses, the super spendy fashion. I'll be following this one with interest. But back to the brawl. I can understand the need of the photographer responsible for the images so proudly bought (and watermarked) by NewsCorp to cash in because that is their job after all but the number of neighbours and random people who shared their stories with the radio stations this morning was cringeworthy. Two long time friends happened to have a heated argument in public. No one knows for sure what they fought over and neither should we. I think we should all just walk away from this right now, like we all would have if the friends in question were people just like ourselves and not super wealthy and linked to enough other beautiful people to fill up a newspaper columns. Back to my ordinary life and a few things that made me smile today. Finding a Missoni knit scarf I almost forgot I owned. And wearing it into work this morning. I'm at that love affair stage with the crisp 10C mornings out west. And Priceline coupon day. With coupons for two things I actually needed to buy! I snuck in that Falsies mascara. It didn't have a coupon but it was $4 off. I feel better about going in to work tomorrow already. My masacara's all sorted out, I just have to figure out what to wear. Might have a think while I catch up with my book as I turn in for the night. Isn't the fight ridiculously poor form??! I mean seriously? Mr Fascinata reckons they must have been on the turps. Sickened by the children's kidnap. Heard the news say the terrorists said they should be married, not educated. Pray for them. It just gets worse and worse for those poor, innocent girls. I heard on the news Monday that an advocate for them and their parents was arrested by the President's wife. Apparently the parents themselves live in a very remote and dangerous part of the country and were unable to attend the meeting Patience set up. The advocate was there and somehow angered her and then got arrested. It's sickening. You've made a really good point here about the fact that it hasn't been a slow news day, yet all we keep hearing about is this stupid brawl, and the fact that some protesters did some chanting on QandA last night. What irritates me the most about this brawl though, is that we've had so much in the media about how dangerous one punch hits can be, and how it's cowardly and yet people are laughing this off as two blokes, and this is what guys do and isn't it interesting, and oh how funny because they're actually good mates.Makes me rage. Thank you for bringing up the coward punch issue. Will this end up being a case one law for us and one for them? If a person chooses not to press charges against a friend, does this make the act any less dangerous? They probably had their biffo, then went to the pub and declared their love for each other over a few pints. WE SO NEED TO GO SHOPPING TOGETHER!!! It seems trivial after reading about the nigerian girls, but keep an eye out in Coles. They often have Maybelline for 30-50% off. I saw most of their mascaras were 50% off last week (so less than $10 each!). Anon again here - I just did my daily Coles sweep and Garnier BB cream is $7 a tube! Just got my hands on a tube of the sensitive skin version for $9. Hadn't heard a thing about the brawl over here, obviously I suppose. Anyway thanks for looking after the expats. I'm sure you are on top of it but don't forget to hit up TJ Maxx while over here, and have a fabulous holiday.